Mix soy sauce, vinegar, honey. The overall taste should be led by sourness, then saltiness and sweetness to mold everything together. Lay chicken breast in the baking dish. Important! The size of the dish should perfectly fit the breast’s size so it will be covered with the sauce when we pour it in. Put ginger (chopped) on top of the chicken breast. Pour in the sauce. Bake at 180°C/350°F for approx. 40 min. Boil the udon noodles. Follow the package instructions (shouldn't take more than 10 min.). When the udon noodles are cooked, rinse them with cold water. 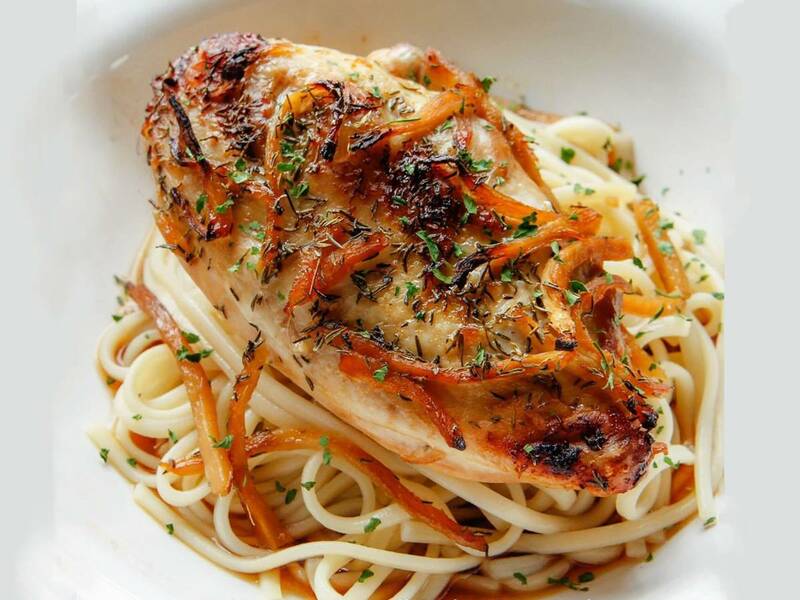 Put noodles on a dish first, then chicken on top, and pour the juice we get from roasting the chicken over the dish. Sprinkle with parsley.